I use my GPS almost every day. The whole concept of a GPS is fascinating. The way they work is that 3 satellites measure the distance between their position and your position. This calculates your 2D position (latitude and longitude). Google Maps only needs your 2D position to tell you where you are and where you should go. But why 3 satellites? Why not only 2? 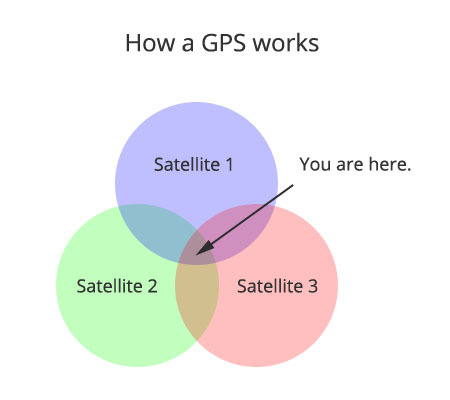 Since the satellites measure the distance between you and them, it means you could be at any point where those 2 overlap. That’s not helpful. A third satellite allows devices to use a mathematical process called trilateration to precisely pinpoint your location. Who am I kidding? You probably already knew this. How do we use this same trilateration process to create incremental value with analytics? You might have already guessed that this has nothing to do with satellites or a literal GPS. To be effective analysts, we have to have multiple sources of input to provide recommendations. 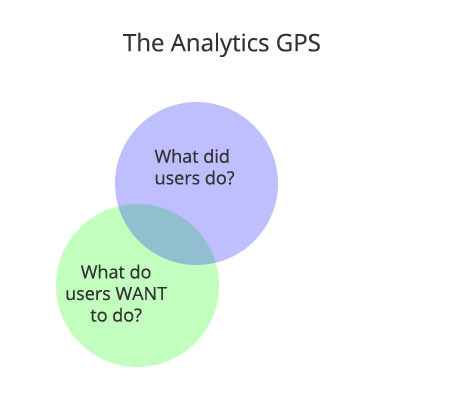 For most of us, that starts with the data… usually from Adobe Analytics or Google Analytics. This data answers the question: What did our users do? What did our users do? What do our users WANT to do? What do WE want users to do? 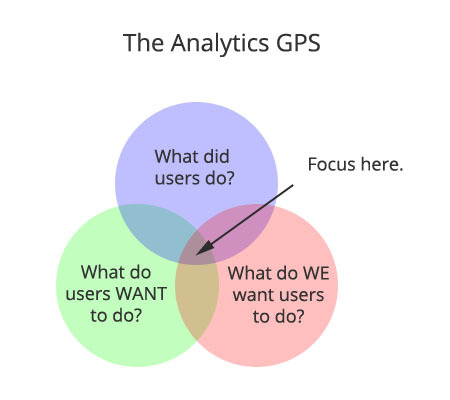 How do we complete the analytics GPS? How to answer: What did users do? 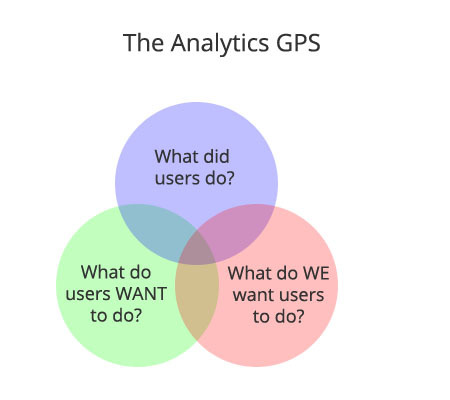 How to answer: What do users WANT to do? How to answer: What do WE want users to do? What if I can’t answer one? When you report in a vacuum, this is what you get. You can answer questions about revenue, engagement, content affinity, acquisition; but then what? As the CEO, this doesn’t get me any closer to helping me drive my business in the right direction. It’s already clear why this is a problem. There’s no clear indication of why any of this data matters and driving valuable decisions based on data alone will likely yield unproductive results. Some people spend an entire career in this circle – and often folks stuck here aren’t making any recommendations at all. A high bounce rate on the email unsubscribe page is a worthless data point. A spike in conversion rate looks great on paper, but the data point alone leads me nowhere. We need another satellite to point us in a better direction. Often we explain behavior through gathering feedback directly from the user by asking them: What did you come here to do on the site? We’ve deployed surveys, conducted focus groups, and compiled data from user testing. Based on analytics and survey data, we see that the primary audience is a 45 year old female. We understand where users are experiencing friction on the site through user testing. We know that based on a survey that they don’t want to see certain products on the homepage and that the price is too high. With this data, we can provide proactive recommendations to facilitate a better general user experience for this audience and also several other audiences that were teased out of our analysis. We did it! Right? Obviously… wrong. We’re still missing that third satellite. While we’re accommodating the experience for users who are currently visiting the site, no one bothered to stop and ask the question of whether these are the users the business wants to target. There isn’t any indication of whether the actions users are taking on the site are the ones the rest of the business wants them to take. Ironically, the last question is the most accessible one to ask but is often the most difficult to get a straight answer. It implies that someone has to take a risk and pick a direction. The question is: What do WE want users to do? Someone needs to decide on a strategy. Maybe it’s the CEO. Maybe it’s the VP or Director. Someone needs to step up and decide what will drive the needle on the business’s stock price. In my experience, this last question is the most difficult for clients to answer. That’s because there’s an associated risk. It forces someone to choose a strategy and direction, implying accountability. This also gives meaning and direction to the work everyone does. Without this, you’re likely making the wrong recommendations and your organization could be moving in the wrong direction. Oh, you thought it was easy? You thought there was a silver bullet at the end of this? There isn’t. 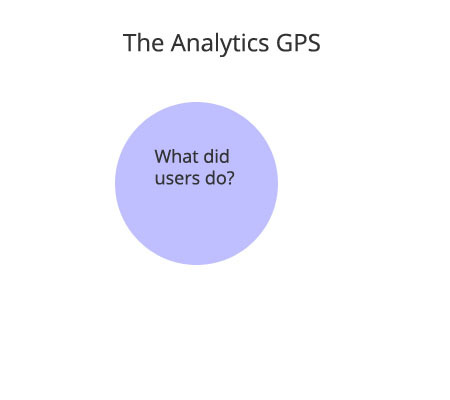 The truth is that you don’t just depend on the GPS – everyone else does, too. While you might get all of the answers to these questions, there are still steps you might have to take to evangelize this information. Let’s talk about how you can answer these first. This is in our control. Let’s ensure we trust our data and the definitions of our dimensions and metrics make sense to us and the rest of the organization. Maybe that means building out a data dictionary. The only thing more important that you understanding the data is your stakeholders understanding the data. This might not be in our control since it’s often a function of a UX team (or whatever they’re calling themselves these days). There are still steps you can take to collect this data – like leveraging usertesting.com or deploying surveys through your tag management system. The best route is to see what’s already available by building a connection between your department and the team that conducts this research. Find the person who has “ownership” of what you’re trying to improve and ask them. If they don’t know, ask their boss. There’s no tool that will give you this answer, but there are tools available that will help you ask them the right questions. In short, schedule stakeholder interviews… and schedule them quarterly, if possible. Strategies change. Well… why not? The analytics piece is easy (what users did). I often find that the other two might get tricky. You can still do a semi-effective job if you can only answer what users did and what we WANT users to do. However, we’re still not answering whether we’re pulling in an audience that wants to do it. All of the measures we take to optimize the site might be for the wrong people! Always recommend conducting user research so you can at least say you tried. The point of this model isn’t to put the responsibility of the entire company on the shoulder of the analyst. In fact, it’s the opposite. It protects us. It’s to keep us out of trouble when we need to push back on reporting for things that don’t matter to the business. It’s to make our work more strategic and less operational. Lean on this as a GPS to help guide your business and your work in the right direction. This the foundation upon which data driven companies are built.